A derivative of the Lockheed F-80, the T-33 went on to completely overshadow its sibling. By far the most popular jet trainer of the 1950s, the T-33 served in nearly every NATO Air Force and many others besides. 6557 T-33s of all types were produced, including 656 by Canadair in Canada, and 210 by Kawasaki in Japan. 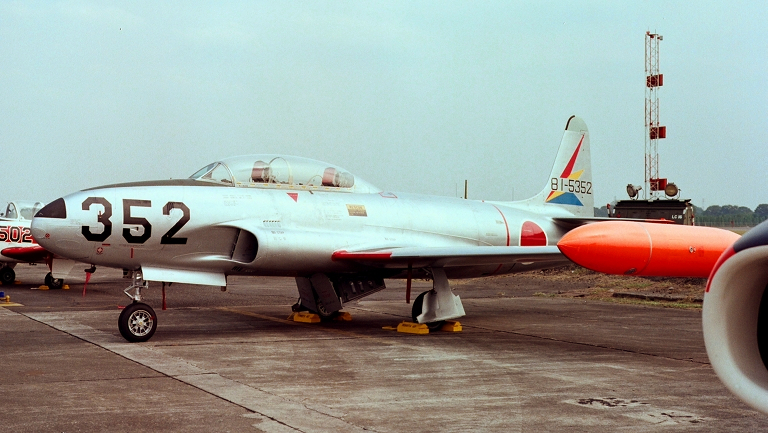 The T-33 was nicknamed San San in Japanese service. The moulding is very crisp and clean. There is no flash to speak of, and no sink marks. Ejector pin marks are confined to the insides of the major parts where they won't be seen after assembly. The fuselage is in four parts, separated at the engine access break point. I'm not sure why Platz chose to do this, because they don't provide an engine in this box. Perhaps it's reserved for an extra detailed equivalent to Eduard's “Profi Pack” kits? The instructions would have the modeller make up the front and rear fuselage halves, then join them to the wings and each other. It may be better to join each front and rear fuselage half together before attempting to put the halves together to complete the fuselage. Trapping the cockpit, nose wheel well and jet exhaust between them may be a little more difficult if this option is chosen. Surface detail is a mix of very restrained engraving and raised detail where appropriate. The kit represents a Japanese Kawasaki-built T-33. I am not qualified enough to tell whether the panel lines and details are accurate for a Lockheed built machine. Modellers wishing to build a Nene-powered CT-133 will need to do a little converting. The nose-mounted machine gun ports (Many T-33s carried two guns for gunnery training) are shown blanked off. If you wish to arm your T-33 you're on your own. The cockpit is sparse, but then so was the real thing, and most of them were black so details won't be very visible under the one-piece canopy. The instrument panels and side consoles may be painted, or you may choose to use the decals. They look as though they'll conform over the moulded detail well enough. The canopy itself is very clear and free from distortion. It's a pity that there's no option to display it open short of some risky surgery. The instructions note that 3g of nose weight will be needed. The lower wing is in one piece which includes a section of the lower centre fuselage including the air brake wells. The air brakes are separate, but the wells are pretty much devoid of detail. The upper wing halves are one piece for each side. The wings are designed to have the tip tanks mounted in place. Since it is incredibly rare to see a T-Bird without them, that's an adequate engineering decision. The tailplanes are one piece mouldings that fit very well but still need glue. The vertical fin is part of the fuselage mouldings. The fin and rudder are completely on the left fuselage half. This makes for a very fine trailing edge, but that comes at the expense of a seam which must be filled on the right side at the base of the fin. Careful fitting will help to minimise it but cannot completely eliminate it. The intakes are blanked off by a half-round approximately 1 cm deep. I think they'll look quite convincing. The exhaust comes in 3 pieces; two halves of the jet pipe, which join to the exhaust outlet. There will be a difficult to fill seam in the jet pipe, which must be built and then trapped between the rear fuselage halves. There does not appear to be a representation of the turbine fan to block up the inboard end of the jet pipe. This means that your T-bird can be see-through if steps aren't taken to correct it. The landing gear struts and wheels are very delicate and may be prone to breakage. There is some nicely restrained detail in the wheel wells which will benefit from careful painting. Happily, the gear legs can all be attached after the rest of the build is complete, which makes for a much less stressful time compared to the old Airfix F-80 whose nose wheel I have broken off too many times to count. I don't compare models to drawings or published measurements. When assembled it looks like a T-33. The decal sheet is very complete, with a good variety of stencils and complete markings for 6 different aircraft from JASDF Hamamatsu Air Base. All are in overall natural metal with varying amounts of brightly coloured trim. The decals are thin and glossy, beautifully printed and have very minimal carrier film. The tiny stencils can be read under magnification. Colour call-outs reference Gunze Mr Color and Testors Model Master. A representative JASDF T-bird on an Airshow static display. Lows: Needlessly complicated fuselage assembly. No turbine fan. Verdict: This model will be an enjoyable build.